Work on the Carmelite convent and church here begun in 1268, using funds provided by Agnese, the widow of merchant 'Cione Tifa di Ranieri Vernaccia from the Santa Felicita quarter'. But the church was not consecrated until 1422, with work on the Brancacci Chapel frescoes beginning almost immediately. The convent complex, much of which remains, was enlarged in 1328 and 1464. Interior modifications to the church by Vasari in the late 1550's resulted in the removal of many medieval frescos and panels. There was some rebuilding in the 17th century then extensive work in the 18th century, covering the old trussed ceiling. Before this work was completed the church was largely destroyed by fire on 28/29th January 1771, but the Brancacci Chapel was spared, although the frescoes were heavily damaged and restored. The interior was rebuilt by 1782 in bog-standard baroque style, to designs by Giuseppe Ruggieri, resulting in its current appearance. The unfinished façade, begun in the early 15th century, remains. The main church is surprisingly vast, and has vertigo-inducing ceiling paintings by Domenico Stagi, who did the trompe l'oeil architecture, and Giuseppe Romei who did the paintings - the ceiling has the Ascension of Christ and in the dome is The Trinity and the Virgin in Glory with Saints. There's a stained-glass window with a panorama of Florence in the façade (see photo right). There are shallow side altars down the nave - they're more niches really - and very deep transepts, with the Brancacci Chapel at the end of the right-hand one. The Corsini Chapel is at the end of the left one (see below). It contains the remains of Saint Andrew Corsini, a Carmelite friar who became Bishop of Fiesole, from 1349 until his death in 1374, and was canonized in 1724. He was venerated for his miracles. (see Image cults below). 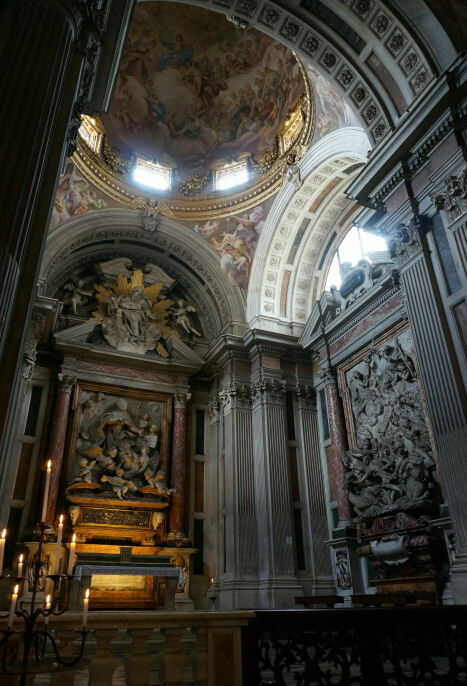 The chapel was designed by Pier Francesco Silvani and was decorated between 1675 and 1683 with frescoes in the dome (The Transfiguration of Saint Andrew Corsini) by Luca Giordano and marble reliefs by Giovanni Battista Foggini depicting scenes from the Saint's life. (Giordano added the figures in the pendentives, however, on his return to Florence in 1682.) During this process a St Peter by Masolino and a St Paul by Masaccio, frescoed on the outside pillars of the chapel around 1425, were destroyed. In the old refectory, which is off of the 17th century cloister through the door to the right of the gift shop (the old chapter room) through which you have to go to get to the Brancacci Chapel, there's a Last Supper of 1582 by Alessandro Allori that's well worth a look and features two cats. It's in this refectory where they show a (sleep-inducingly comprehensive) film about the church and chapel. If you wait for the film to finish the lights do come on and let you look better at the underdrawings also on show, but they're not terrifically interesting. A lot of the figures in Allori's fresco do bear a very strong resemblance to those in Andrea del Sarto's Last Supper in San Salvi, although Allori increases the quality of the tableware and the variety of festive fruit. Andrea did teach Pontormo, who taught Bronzino, who in turn taught Allori. A second refectory evidently has a Supper in Simon the Pharisee's House by Giovanni Battista Vanni of c.1645 and there are frescoes by Lippo d'Andrea in the sacristy. Also mentioned are fresco fragments by Pietro Nelli and Starnina. Filippo Lippi's fresco The Conferral of the Carmelite Rule was found in the cloister in 1859, detached in 1939, and is now kept in a room inaccessible to the public. There's also a sacristy that I've never got inside with frescoes of The Life of Saint Cecilia by an unknown artist of the 1420s, possibly Lorenzo di Bicci. A wing of the large convent is still used as a charitable hospice. 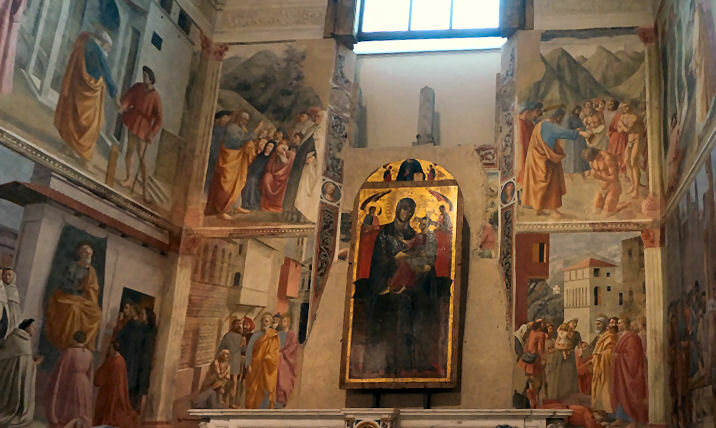 A miracle-working panel-painting of the Madonna, the Madonna del Popolo, dating from around 1260, was over the main altar here until replaced in the 1420s. The legend of the founding of the Carmelite order traces their origin to a community of hermits on Mount Carmel, and they are said to have brought this painting back from there. It became retrospectively linked to the legend of local Carmelite, the Beato Andrea Corsini, when later chroniclers claimed that Corsini's mother had prayed for a son before it, promising this son to the Carmelite Order. 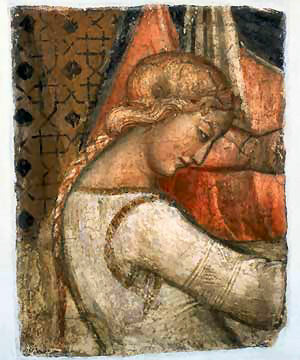 The same image was also claimed as responsible for Florence's victory over the Pisans in 1406. There were also two crucifix cults. One, the Crucifix del Chiodo, of the late 14th or early 15th century, hung on a pillar in the nave. It was said that the same Corsini left his tomb to kneel at this crucifix and was seen to be 'crying forcefully'. 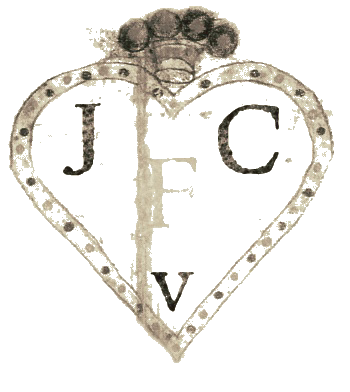 This crucifix did not survive the fire of 1771, although the Madonna del Popolo and the other miraculous crucifix, which sweated, the small Crucifisso della Providenza, are still to be found here. The Brancacci Chapel is one of the glowing gems of the early Renaissance. If you've studied Renaissance art, formally or for pleasure, you'll have read much about these frescoes, especially Massacio's, but coming here is essential if you're a lover. They depict The Life of St Peter, the name-saint of the donor. The patron was Felice Brancacci, who commissioned the work in memory of his uncle, silk merchant Piero di Piuvechese, who had left the money to build the chapel in his will. Building work was completed in 1389. The decoration was begun by Masolino in 1424, with the vault and the upper panels. He was joined by Masaccio until 1425. Masolino then went to work in Hungary and Masaccio continued on his own, but himself went to Rome in 1428 and the work halted. He died in Rome later in 1428 at the age of 27. Masolino outlived his pupil, dying around 1435. The identification of the division of work between Masaccio and Masolino has long bothered art historians. Each artist's scenes often include considerable contributions by the other. 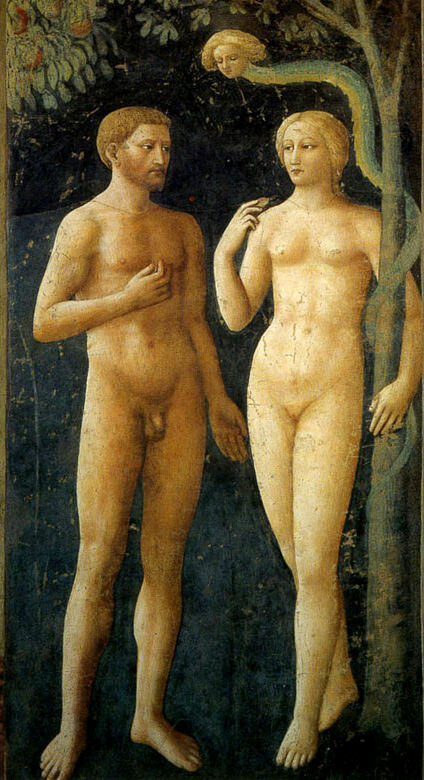 Their styles are best appreciated by looking at their representation of Adam and Eve, Masolino's elegant but softer and flatter scene of the temptation contrasting with Masaccio's more emotive and solid banishing (see below right). Felice Brancacci drew up a will after the work had finished instructing his heirs to get the decoration completed, but he fell into political disgrace for supporting Palla Strozzi (his father-in-law) and was banished in 1436. The chapel was renamed and the part of the fresco that featured the patrons was destroyed. The frescoes were completed 50 years later by Filippino Lippi, from 1481 to 1485, following the rehabilitation of the Brancacci family in 1474. He finished the lower scenes begun by Masaccio and added his own, The Crucifixion of Saint Peter and The Disputation with Simon Magus. Between 1746 and 1748 Vincenzo Meucci frescoed the ceiling, with The Virgin Giving the Scapular to Saint Simon Stock, and so destroyed Masolino's Evangelists. (Meucci was also the man responsible for the 'restoration' work on Rosso's Marriage of the Virgin in San Lorenzo which resulted in a sludgy over-varnished appearance, only reversed during restoration in 2014.) The enlargement of the window at this time also resulted in the destruction of parts of frescoes. Restoration work in the late 1980s resulted in the colours again shining forth. The altarpiece, the Madonna del Carmine (also known as the Madonna del Popolo) is the earliest of such Maestà painted for churches in Florence and is one of very few remaining in a church and not removed to a museum. It was painted for the original church around 1270, probably for the high altar, but was in this chapel by 1460, having been moved here when the chapel was renamed in its honour following the exile of Felice Brancacci. It is possibly the work of Coppo di Marcovaldo. 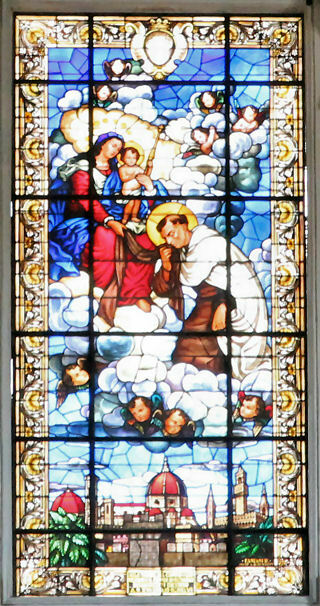 But another theory says it was brought from Mount Carmel, where the Carmelite order was said to have been founded. 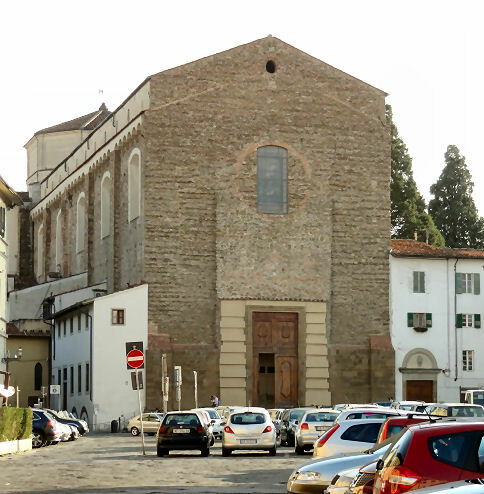 Filippo Lippi took his vows as a Carmelite friar here in 1421 having been an orphan growing up nearby and, according to Vasari, learning to paint by studying Masaccio. He left in 1432. A fresco fragment showing Saint Peter, from the destroyed earlier church, is now in the National Gallery in London. were destroyed, probably in 1675 when the church was remodelled. Masaccio also painted a fresco over the door to the convent in the cloister of the gathering outside the church during its consecration, according to Vasari, with portraits of Donatello, Brunelleschi, Masolino, and Antonio Brancacci. This work was destroyed in the late 16th century. Also twelve fragments of frescos painted by Spinello Aretino for the Manetti Chapel, to the right of the high altar here. The frescos depicted Scenes from the Life of St John the Baptist and were salvaged and removed from the walls following the fire of 1771 by Thomas Patch who also made engravings of the six frescoes and of details of some of the figures. Vasari had said that they were by Giotto. One fragment is in the NG (Two Haloed Mourners 1387-91, usually not on display), two (including Salome, see left) are in Liverpool's Walker Art Gallery. In the same chapel was an altarpiece of The Virgin and Child with Saints John the Baptist, Anthony Abbot, etc. by an unnamed artist, but as Agnolo Gaddi had provided altarpieces on two other occasions when Spinello had frescoed chapels around this time it's thought to have been by him, and to be the Virgin and Child with Saints John the Baptist, Anthony Abbot, Catherine and Mary Magdalene now in the Accademia in Florence. A polyptych painted for the chapel of Chiaro Ardinghelli here 1398-1400 by Lorenzo Monaco. The central panel showing the Madonna and Child is in Toledo. Two double panels showing Saints Jerome, John the Baptist, Peter and Paul are now in the Accademia. Predella panels are in Leicester, Berlin (The Birth of Christ), Baltimore, Princeton and a private collection. 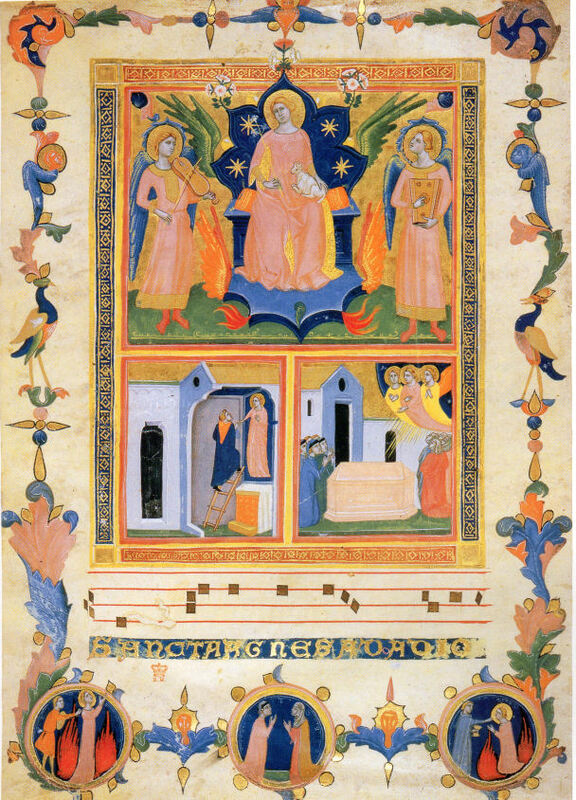 A handsome Laudario (book of hymns to the saints) produced in the 1330s, with illuminations begun by Pacino di Bonaguida and continued by his frequent collaborator The Master of the Dominican Effigies, made for the Compagnia di Sant'Agnese which met here, having their own oratory as well as a chapel in the left aisle. Its 28 remaining leaves or fragments are spread around Europe and (mostly) America. It had been dispersed by at least 1838, and one hundred leaves and over sixty hymns are thought to have been lost. It was one of the last projects by Pacino, a painter and illuminator who has had considerable American academic attention, probably a reflection of the number of his works in American institutions. The page right by him is in the British Library and shows Saint Agnes Enthroned and Two Posthumous Miracles. A page showing The Resurrection and The Three Marys at the Tomb is in the Fitzwilliam Museum in Cambridge. Filippo Lippo's time spent here as a friar and apprentice to Masaccio gets convincingly fleshed out in The Painter of Souls by Philip Kazan. Many churches in Florence were famous for putting on, often spectacular, performances on particular feast days, involving hoists, machinery and fireworks. Here it was the Ascension, enacted by the Compagnia di Sant'Agnese, which saw a Christ figure rising with the help of ropes and pulleys. 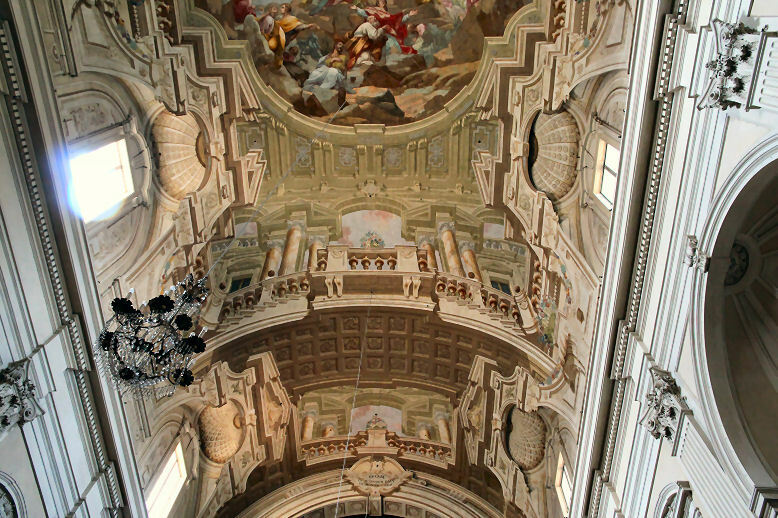 He would ascend from a 'mountain' on the rood screen diagonally to 'heaven', situated over the Cappella Maggiore. This festa was performed here from at least the 1390s to 1497. 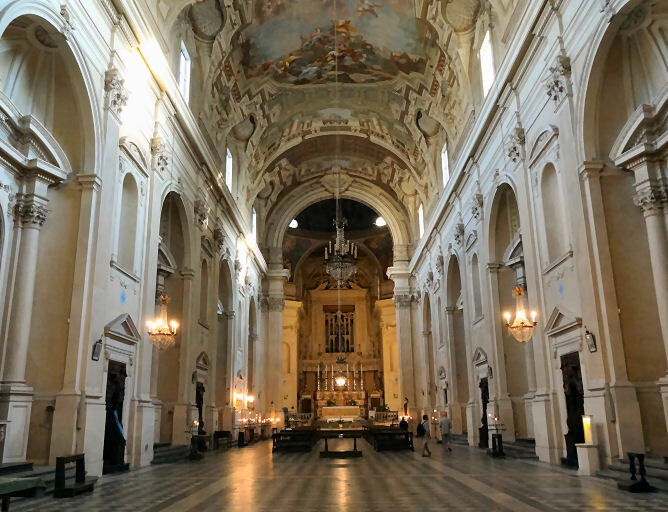 You can now save a few euros by buying a combined ticket for the Refectory (aka the Fondazione Salvatore Romano) at Santo Spirito and the Brancacci Chapel, this being available at the Brancacci Chapel ticket office.